A water sign, Pig is known for its going with the flow, imaginary thinking and lucid dreams, and openness to new beginnings. Pig totem energetically resonates with the season of winter, and is most active during the early morning or evening hours. Pig/boar totem may offer support to energetically change lazy behaviors, overcome procrastination, and give one an appreciative attitude and zest for living fully and with joy. Pigs are social, inquisitive, smart and independent animals, that love to explore and discover amazing food delicacies as they venture along. The pig/boar totem would be perfect for an outdoor enthusiast, foodie, or traveler. In natural circumstances, the pig social structure is based on matriarchal herds and their offspring. 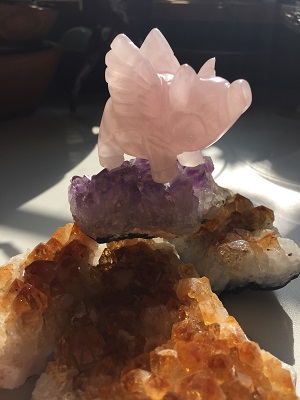 Pig/boar totem represents the divine feminine and may be supportive for female oriented households or multi-generational family living situations. Pig/boar totem energetically supports feelings of devotion and love in relationships with self, partners, family, and the community. Sincerity and generosity are energetic qualities of pig totem. Pig may be a helpful totem for those who would like to be more altruistic and attentive to the needs of others. Pig totem may also act a reminder to not be naïve and act unknowingly. Like boar/pig with their keen sense of smell, this animal totem helps one acknowledge when something doesn't smell quite right and offers energetic protection from unscrupulous people who take advantage of people and situations. Boar/Pig totem teaches one to confront ideas of self-importance, to face your fears, and shred the false beliefs and lies that make up levels of deceit and insincerity. Rooting out your personal weaknesses, wild boar/pig totem digs deep to find a transformational “truffle” turning an energetic liability into something delicious and magical. Saying “YES” resonates with the boar energies; supporting endeavors that are FUN, challenging, and launch you right out of your comfort zone. Use wild boar energy to stand strong and truthful in your space especially when life circumstances feel challenging. Use the pig/boar totem energy to overcome procrastination and to get back on track with personal goals, professional career advancement, and for successful project completion. In healing, Pig totem may be helpful for those with skin issues and body temperature challenges. Vulnerable in hot weather conditions, Boar/Pigs seek shade and wallow in mud or water because it is cooling their skin and system. Pigs do not have sweat glands instead, they regulate their thermal heat levels through respiratory evaporation via their snouts. Due to the pig’s human-like, sparsely haired skin, the coating of mud serves as a sunblock, as well as, repelling flies and biting insects. Boar/Pig Totem may be supportive for those healing from too much sun or as relief from bug bites. Pigs love to be scratched and will rub their bodies and faces against posts, tree trunks, wooden fences, etc. Pig totem may be helpful for those with skin issues and diseases, topical sensitivity, mange, blisters, etc.